The power supply offers an extraordinarily high efficiency up to 85%, and a wide temper -30°C to +70°C, at full power rating, it can go as high as +40°C, which covers most of the extreme environments. Also the power supplies can be used at high altitude up to 5000m max. The average efficiency of the power supply is greater than 85%, which meets the new DoE energy efficiency level VI (US) and CoC Tier 2 requirements in the EU. It also features a low no load input power consumption less than 75 mW. 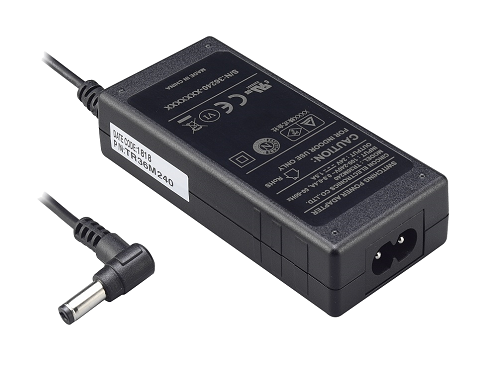 Fully protected against output over-current, output over-voltage and continuous short circuit conditions. It also has been approved for home healthcare application IEC60601-1, EN60601-1, ANSI/AAMI ES60601-1 2MOPP medical safety and EN60601-1-11.Waterproof meets IP21 protection. In addition, all models meet EN60601-1-2 Ed4, EN55011 Class B, FCC Part 18 Class B emissions and immunity standards. IEC60601-1, EN60601-1-11, EN60601-1, ANSI/AAMI ES60601-1 Ed.3.1 medical safety Approved. The adaptor is suitable for a variety of medical applications, such as healthcare, diagnostic and monitoring equipment in the hospital and dental clinic. Furthermore, the design meets EN60335-1 for household appliance, as well as most industrial equipments.